Material design is a comprehensive guide for visual, motion, and interaction design across platforms and devices. 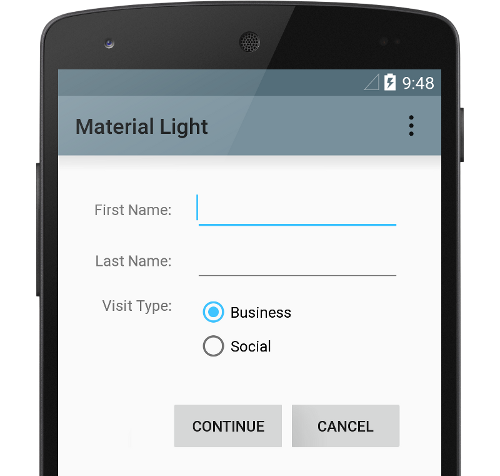 To use material design in your Android apps, follow the guidelines defined in the material design specification and use the new components and styles available in the material design support library. This page provides an overview of the patterns and APIs you should use. To take advantage of the material features such as styling for standard UI widgets, and to streamline your app's style definition, apply a material-based theme to your app. For more information, see how to apply the material theme. Promote your UI's main action with a Floating Action Button (FAB). 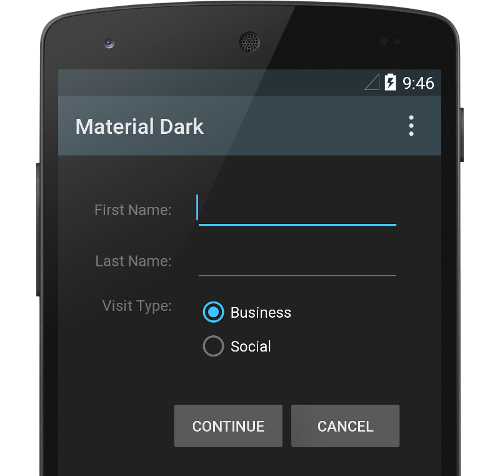 Show your brand, navigation, search, and other actions with the App Bar. Show and hide your app's navigation with the Navigation Drawer. And whenever possible, use predefined material icons. For example, the navigation "menu" button for your navigation drawer should use the standard "hamburger" icon. See Material Design Icons for a list of available icons. You can also import SVG icons from the material icon library with Android Studio's Vector Asset Studio. Elevation is often applied when your layout includes a card-based layout, which helps you display important pieces of information inside cards that provide a material look. You can use the CardView widget to create cards with a default elevation. For more information, see Create a Card-Based Layout. For information about adding elevation to other views, see Create Shadows and Clip Views. For more information, see Animations Overview. Vector drawables are scalable without losing definition and are perfect for single-color in-app icons. Learn more about vector drawables. Drawable tinting lets you define bitmaps as an alpha mask and tint them with a color at runtime. See how to add tint to drawables. Color extraction lets you automatically extract prominent colors from a bitmap image. See how to select colors with the Palette API.